Dentures are artificial teeth that help a person regain normal eating habits without pain. There are two main categories that dentures can fall under: complete and partial. 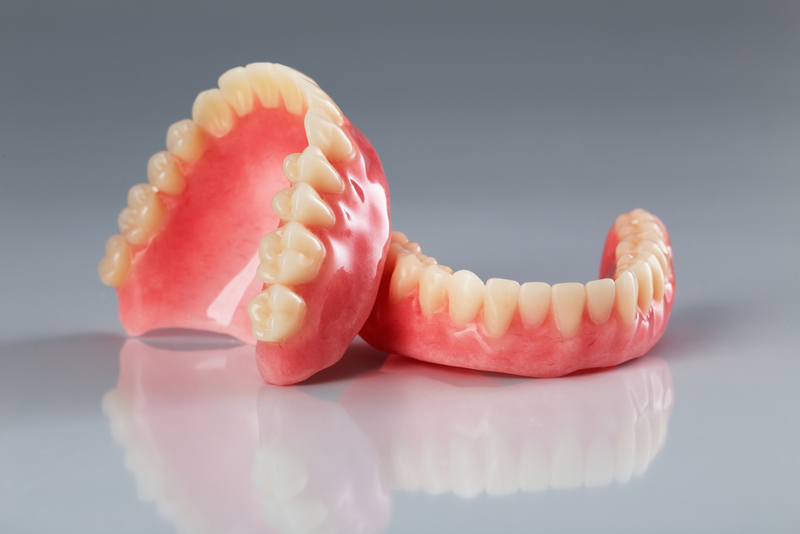 Complete dentures are used when a patient’s remaining teeth simply are not in good enough condition to continue working. The remaining teeth are pulled in order to allow room for a complete set of new teeth to fit in the mouth in the form of removable pieces. With complete dentures, there are two further subcategories: conventional dentures and immediate dentures. Immediate dentures can be worn even while the mouth is healing from the teeth extractions. They are generally considered more of a temporary solution, as the gums and mouth will shift and shrink some during the healing process, meaning they won’t fit properly once the mouth is fully healed. Conventional dentures can be fitted to a patient once their mouth has healed from the extractions. Partial dentures are used when only one or some of the teeth need to be replaced. The tooth or teeth are attached to each other with a removable gum-colored base. When only one artificial tooth is needed, your dentist will sometimes recommend a bridge, where the artificial tooth is permanently inserted in place by attaching it to the surrounding teeth with crowns.